Visitors may be surprised to learn that they have to pay road tolls in Ireland. While all roads in Northern Ireland are free to use, several modern long-distance routes and some time-saving bridges are subject to fees in the Republic. Road tolls in Ireland can indeed be costly if you drive a lot, and more so if you do not take care. Anybody driving in Ireland should be aware that there are toll roads and of the possible ways to pay for them because not all are straightforward barrier affairs. Why Are There Toll Charges in Ireland? That is a very good question, as Irish road users already pay a road tax (and that is not a bargain, either). The National Roads Authority and the Railway Procurement Agency merged into Transport Infrastructure Ireland and has been generally empowered through the Local Government (Toll Roads) Act of 1979 to charge and collect tolls for the use of certain roads. "Certain roads" these days almost always means major new road developments that are funded through so-called Public Private Partnerships (PPP in short). In effect, only part of the funding for a new road under this partnership comes from a public source, with the rest of the funding coming from private, commercial sources. To recoup these investments, a strategy of using tolling to the maximum extent possible on these roads has developed. 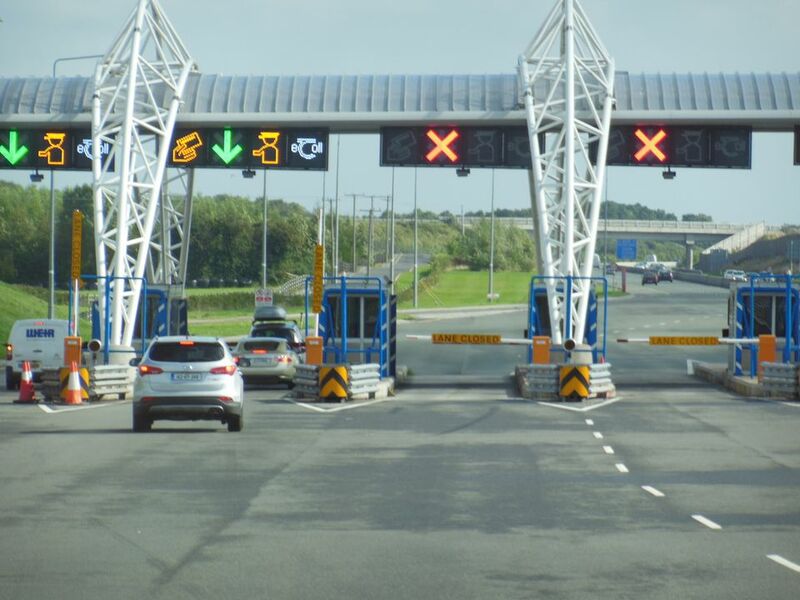 According to Transport Infrastructure Ireland, toll roads are constructed "as additions to the current network of national roads rather than providing a means of improvement of existing roads." In theory, this often means that the old roads decline in quality, become more difficult to drive, and are made by any means possible and as unattractive as possible. These factors might not force, but they entice the driver to switch onto the toll road. Apart from electronic payment systems (tags) that are only of interest to Irish road users, the motto is "cash, credit, or debit card," payable at the toll booth, at machines, or (not 24 hours) to an attendant. If you pay cash, take note that only euros are accepted and that machines will not accept bronze coins. Notes more than 50 euros are also not accepted, and only a few machines are enabled to provide change at all. A notable exception to all this is the Liffey on the Westlink Toll Bridge on the M50, which has barrier-free (and often confusing) tolling. You will be warned by signs that unless you take the next exit, a toll booth is coming up. Heed those signs since there is no way to leave the motorway once you can actually see the toll plaza. At this moment you will have to stump up the fee, either in cash (payable into a basket or to a cashier) or by credit or debit card. The easiest way to pay is via cash payment (in euros only). Sometimes the non-Irish euro coins are not accepted by the automatic systems (they simply fall through, with Spanish coins being the most notorious offenders). At times the automatic system will also bump up your vehicle class and ask for a higher charge. M1 - motorway bridge over the Boyne, between Gormanston and Monasterboice, toll charge for cars is € 1.90. M3 - motorway section between Clonee and Dunshaughlin, toll charge for cars is € 1.40. M3 - motorway section between Navan and Kells, toll charge for cars is € 1.40. M4 - motorway section between Kilcock and Kinnegad, toll charge for cars is € 2.90. M6 - motorway section between Galway and Ballinasloe, toll charge for cars is € 1.90. M7 and M8 Junction - motorway section between Portlaoise West and Borris-in-Ossory (M7) or Rathdowney (M8), toll charge for cars is € 1.90. M8 - motorway section between Rathcormac and Watergrasshill (Fermoy Bypass), toll charge for cars is € 1.90. M50 - motorway bridge over the Liffey between Blanchardstown and Lucan, € 3.10 for unregistered cars. Dublin Port Tunnel (between M1, Dublin Airport and Dublin Port), toll charge for cars is up to € 10 (yes, 10 euros). East Link Toll Bridge (crossing the Liffey near Dublin Port), toll charge for cars is € 1.40. Limerick Tunnel, toll charge for cars is € 1.90. N25 Waterford City Bypass, toll charge for cars is € 1.90. Can Drivers Avoid Toll Charges? You can avoid toll charges by taking a different, slower route. As a tourist, however, most times you can't unless you avoid the clearly marked and convenient roads that are prone to charges and use an alternative. This may be fine if you have the time and local knowledge, but for the casual traveler, it is more often than not advisable to bite the bullet and pay.